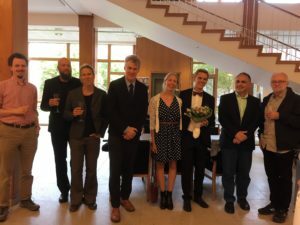 Paul K. Gorbow successfully defended his dissertation, “Self-similarity in the foundations” on June 14, 2018 at the University of Gothenburg in the Department of Philosophy, Linguistics and Theory of Science, under the supervision of Ali Enayat, with Peter LeFanu Lumsdaine and Zachiri McKenzie serving as secondary supervisors. 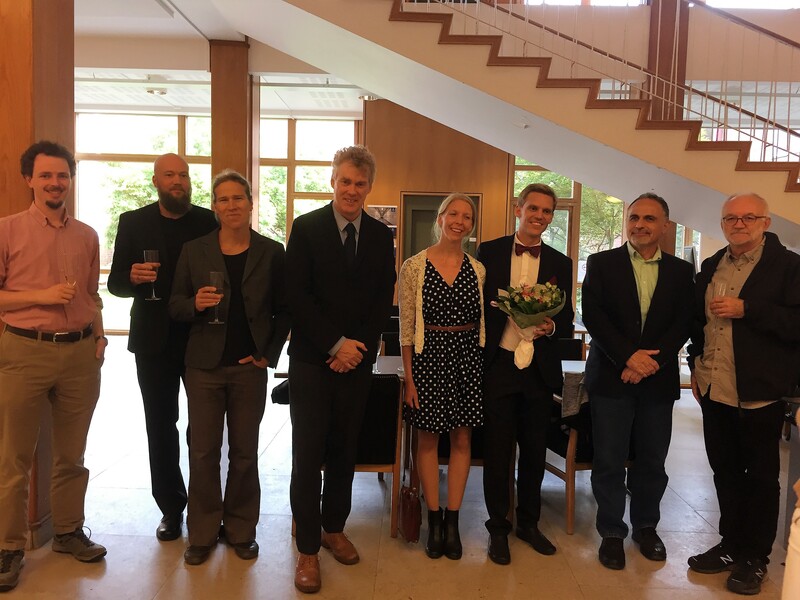 The defense opponent was Roman Kossak, with a dissertation committee consisting of Jon Henrik Forssell, Joel David Hamkins (myself) and Vera Koponen, chaired by Fredrik Engström. Congratulations! Abstract. 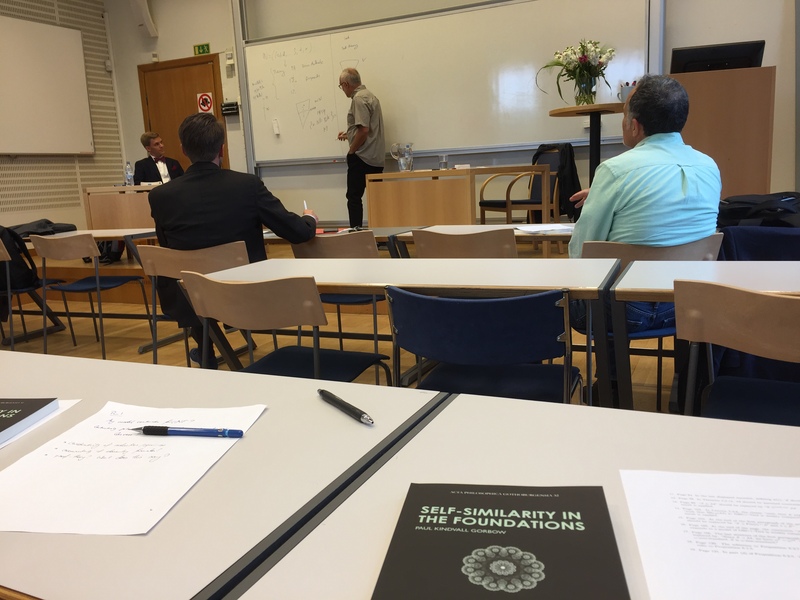 This thesis concerns embeddings and self-embeddings of foundational structures in both set theory and category theory. The first part of the work on models of set theory consists in establishing a refined version of Friedman’s theorem on the existence of embeddings between countable non-standard models of a fragment of ZF, and an analogue of a theorem of Gaifman to the effect that certain countable models of set theory can be elementarily end-extended to a model with many automorphisms whose sets of fixed points equal the original model. The second part of the work on set theory consists in combining these two results into a technical machinery, yielding several results about non-standard models of set theory relating such notions as self-embeddings, their sets of fixed points, strong rank-cuts, and set theories of different strengths. The work in foundational category theory consists in the formulation of a novel algebraic set theory which is proved to be equiconsistent to New Foundations (NF), and which can be modulated to correspond to intuitionistic or classical NF, with or without atoms. A key axiom of this theory expresses that its structures have an endofunctor with natural properties. 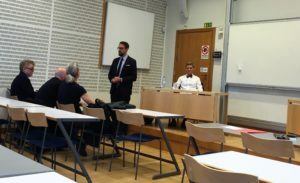 In the Swedish style of dissertation defense, the opponent (in this case Roman Kossak) summarizes the dissertation, placing it in a broader context, and then challenges various parts of it, probing the candidate’s expertise in an extended discussion. What a pleasure it was to see this. After this, there is a broader discussion, in which the committee is also involved. 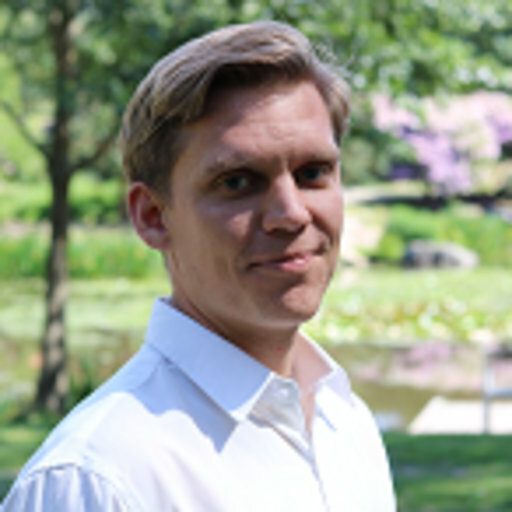 This entry was posted in Students and tagged category theory, countable models, elementary embeddings, embeddability, models of PA, NF, nonstandard models, self-embeddings by Joel David Hamkins. Bookmark the permalink.